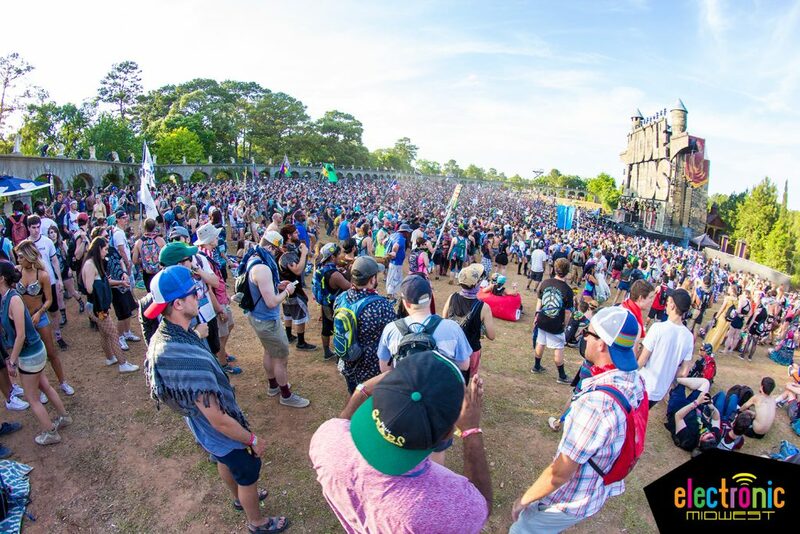 Middlelands, a renaissance-themed festival from producers Insomniac Events and C3 Presents, made a near flawless debut this weekend as nearly 30,000 attendees gathered together at the Texas Renaissance Fairgrounds outside Houston, Tex. This marks the festival’s inaugural year, but it would be easy for one to assume this event is well into its tenth year given the attendance numbers, level of production, and smoothness of operations. This is due in part to the venue itself, but mostly thanks to producers who have clearly become experts in their craft. 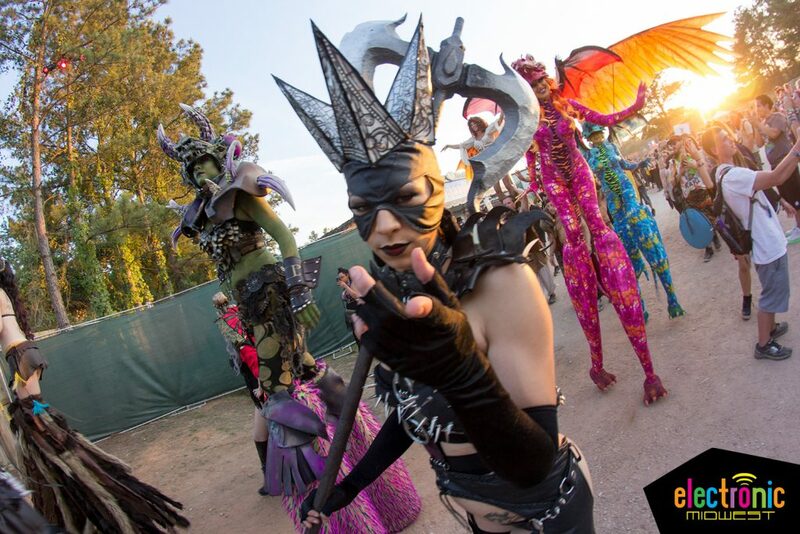 Insomniac — the minds behind Electric Daisy Carnival — is no stranger to Texas, but it’s been five years since the group produced a festival here, the last being Nocturnal Wonderland in April 2012. Co-producer C3 presents calls Texas home and produces festivals Austin City Limits, Lollapalooza, and Shaky Beats, among others. But make no mistake: Insomniac’s brand shines brightest here. 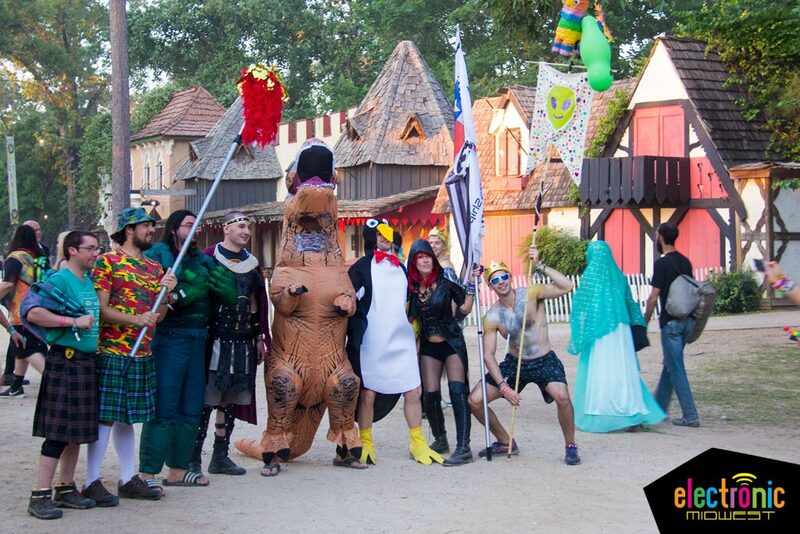 While it’s not clear whether the discovery of this venue or the idea for a renaissance-themed festival came first, utilizing the Texas Renaissance Fair grounds is sheer brilliance. The space is already home to a two-month-long festival each fall and also hosts weddings and other special events year-round. Permanent fixtures and infrastructure that would normally take festival producers months to construct already exist, saving an incredible amount time and resources. Rows of intricately decorated Medieval storefronts surround the main festival streets, while concrete amphitheaters serve as home to musical stages and performance spaces. There are real, operating retail shops for all sorts of on-theme merchandise and goods, offering everything from wooden swords and armory to handmade soaps and fragrant essential oils. These shops are in addition to the pop-up vendors exhibiting your usual glowing rave wear and festival fashions. It appears only a small portion of these permanent structures were utilized with many hidden behind backstage walls, allowing plenty of room for growth. Much to the delight of all, permanent bathrooms with flushable toilets and running water were accessible throughout the venue. Most festivals can only dream of offering such a thing. Parking was well organized with minimal wait times, and festival entry points with ID and security checks moved quickly. Recycling bins were noticeably absent inside the venue, although trash cans were plentiful. The grounds were kept surprisingly clean, thanks (hopefully) to conscious fans and a cleaning crew who roamed the grounds seemingly nonstop. While expansive, the main festival grounds were still relatively compact. The walk between the farthest stages did not seem overwhelming, but it was still easy to step your way to double digit miles at the end of a long day. Three large and two smaller stages were spread throughout the grounds: Castle Northwoods, Middlelands Arena, The Stronghold, Trinity Vale, and Wench’s Bay (listed in order of size). Main stage “Castle Northwoods” was, as the name would infer, shaped like a castle with massive and creatively shaped LED panels in the background, allowing producers visual creativity throughout the weekend. 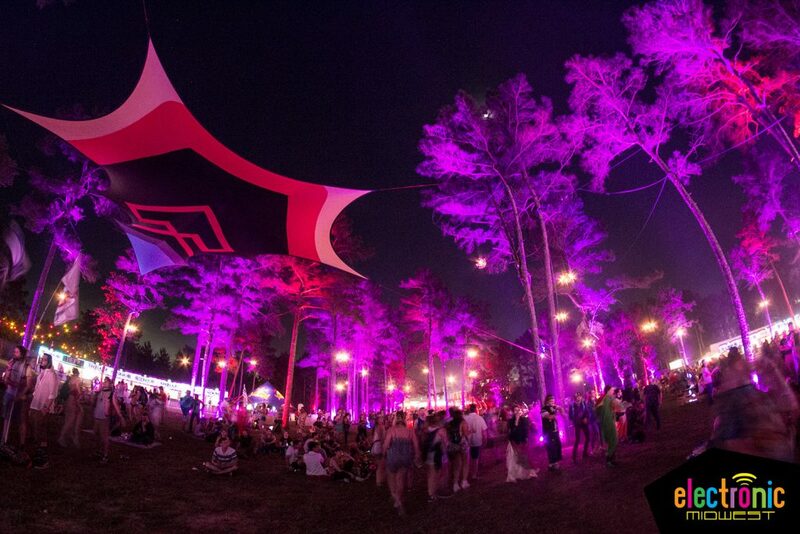 Nestled among towering tress, many stage elements were difficult to see here, even from VIP viewing areas. 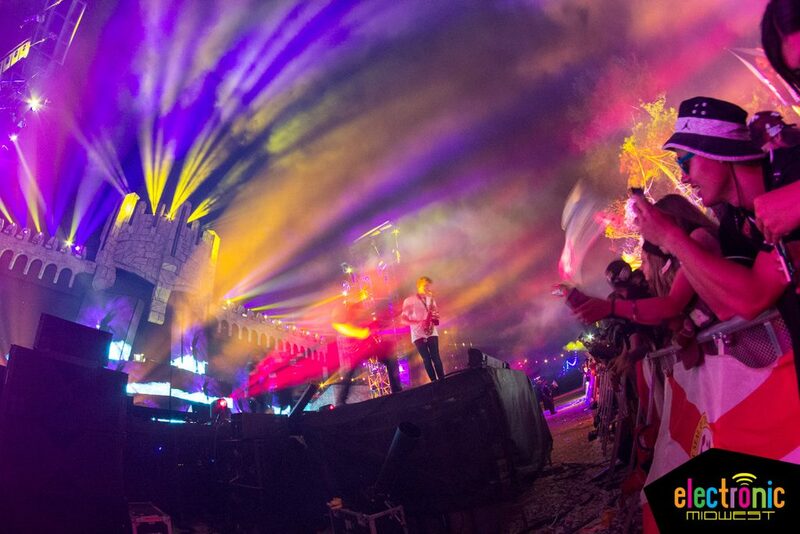 “Middlelands Arena” was the most impressive, with a massive recreation of the festival’s logo serving as the backdrop. The stage and dance floor was contained inside an amphitheatre surrounded by a crescent-shaped wall topped with statues of gods and goddesses, providing a Colosseum-like atmosphere. 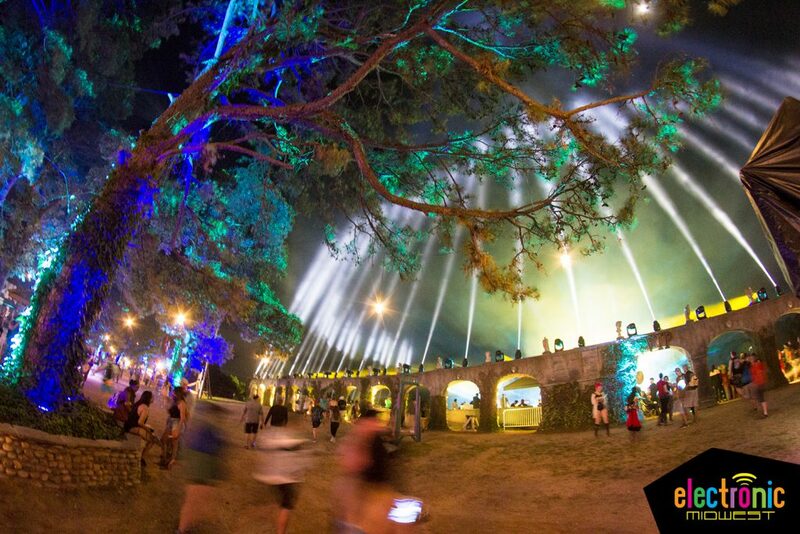 After dark, creative lighting turned trees and stretched fabric canopies throughout the grounds into palettes of colorful art overhead, a nod to some of the stunning special effects seen at Electric Forest. A wooden bridge covering a small lake between Castle Northwoods and the Stronghold stages was lined with Medieval flags followed by a walkway covered with colorful PVC pipe domes. A giant throne served as a photo opportunity for all. Costumed performers dressed as ogres, owls, gladiators, jesters, and other themed creatures danced on stages and paraded among the crowds, while flame jugglers performed off to the sides of stages. 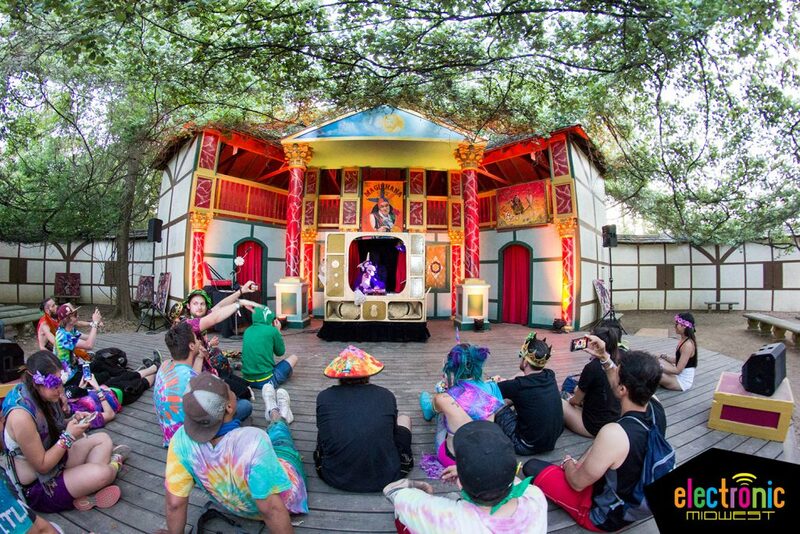 A vine-covered amphitheatre in the center of the venue served as home to more visual-based performers, including Jive Joint, magicians, and the Fungineers. The only production hiccup witnessed came during Griz’s Saturday night main stage performance when the set came to a full stop so a man who had climbed a tree could be safely rescued. Nearly half of festival attendees camped in what appeared to be one the most well organized campgrounds ever witnessed (again, thanks in part to all the permanent infrastructure here). Rows of trees created natural lines to form alternating rows of tents and cars, allowing you to park your car steps from your campsite, yet separately to keep things neat and compact. Two activity areas in the campgrounds — Conqueror’s Court and Enchanted Gove — provided a wide range of programming options, including stargazing with the Houston Astronomical Society, move showings, daily yoga classes, archery tag, and nightly bonfires. 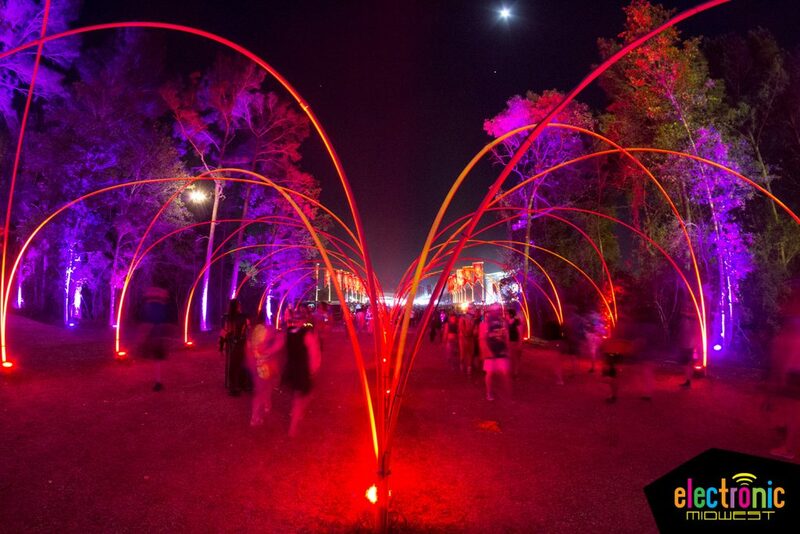 Insomniac’s “Sound Camp” served as home to a pre-party on Thursday and after-hours parties with festival performers until 4 a.m. each night. The “Wide Awake Oasis Bar” provided the perfect hangout space at night and much needed shade from the sun during the day. For those not interested in camping, a variety of affordable hotels were located within 30-45 minutes of the venue and shuttle service to Houston was available. On-theme options like roasted turkey legs, grilled sausages, and “steak on a stick” were plentiful. One attendee shared her turkey leg with a group of bartenders and even random strangers as they passed by while she waited for a drink to be made. A handful of local food trucks were also onsite, serving up everything from chicken and waffles to poke bowls. A good variety of craft and light beers were available, but drinks containing hard alcohol had to be consumed in a contained area, presumably to appease local/state liquor laws. The crowd resembled something closer to what you’d find at Electric Forest rather than EDC (in other words: more hippie, less raver). When it came to attire, some embraced the medieval theme, but almost all adorned themselves in festival wear of some sort. It should be noted only a handful of fluffies or pasties were seen throughout the weekend. This festival has yet to totally develop a unique personality and culture to fully distinguish itself from other events (beyond the decor, of course). But then again, it’s only year one. 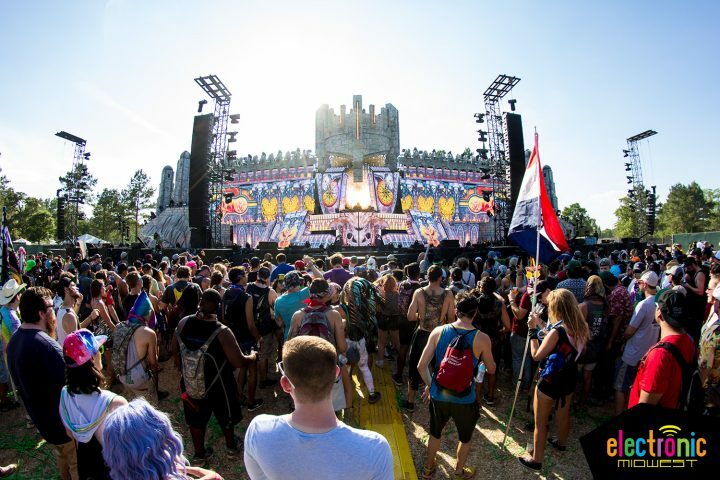 A handful of folks on social media claimed Middlelands has finally filled a void left in the South after the fall of Atlanta’s TomorrowWorld. And they may just be right. A crowd-pleasing roster of artists, picture-perfect weather, and an incredibly unique venue all combined to create one of the more unforgettable experiences in recent memory — even for the most seasoned festival vets among us. It shouldn’t be surprising given Insomniac and C3’s involvement, but it’s still impressive how well this first year festival was executed. It’s no easy task to produce a show of this magnitude — especially with camping — while successfully launching a marketing campaign powerful enough to attract over 30,000 attendees. But they pulled it off, and they exceeded expectations in almost every way. As they always do. And, if Bassnectar’s tweets are to be believed, you can mark your calendars now because he’s already been asked to return for the second installment.